MOSCOW, June 13 (Xinhua) -- The situation on the Korean Peninsula is developing in line with the road map proposed by China and Russia, Russian Foreign Minister Sergei Lavrov said Wednesday. "Apparently, Washington and Pyongyang are moving exactly in this direction," Lavrov said at a press conference in Moscow, referring to the historic summit between the leaders of the two countries. He said the road map advocated by Moscow and Beijing includes the rejection of bellicose rhetoric and provocative actions by the United States, its allies and the Democratic People's Republic of Korea (DPRK) at the first stage. At the second stage, it proposes establishing direct contacts and starting discussions concerning all existing problems and concerns. Lavrov said the DPRK and the United States are "still at the very beginning of the second stage." 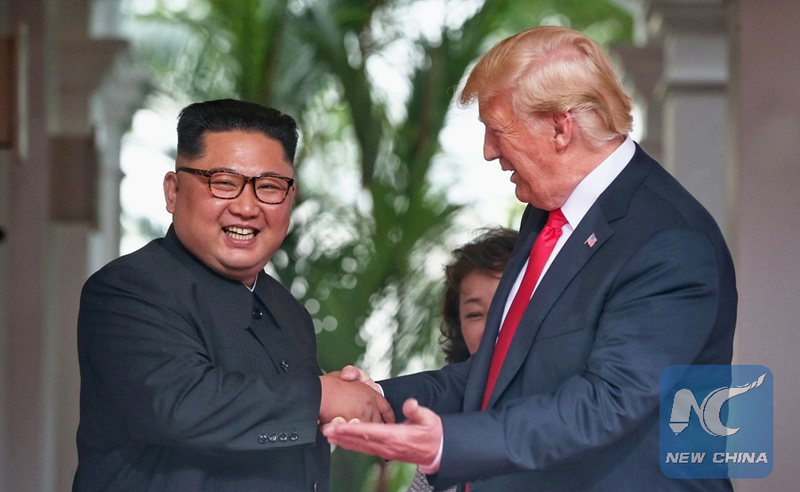 DPRK top leader Kim Jong Un and U.S. President Donald Trump signed a joint statement in Singapore Tuesday, agreeing to a complete denuclearization of the Korean Peninsula in exchange for U.S. security guarantees. The document bears the clear character of a framework and it will take a very long time to coordinate the details, especially those related to the most complicated problem of the DPRK's nuclear capabilities, Lavrov said. Relevant problems can be hardly resolved to the fullest in a bilateral format, Lavrov said.